Remove OEM H22 Fuel Rail main line bolt? 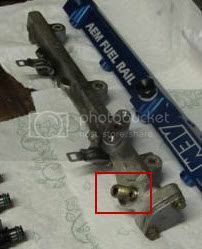 Remove threaded stud from stock H22 Fuel Rail? I'm trying to replace my stock h22 fuel rail with a spare one that I have. The only issue is that I cannot remove the threaded bolt that sticks out where the main fuel line connects to (see picture). I need to remove this because my B&G fuel pressure gauge sits on top of that, which bolts into that hole. Last edited by K-Spec; 09-26-2010 at 09:32 PM. Re: Remove OEM H22 Fuel Rail main line bolt? If you look at the pic above where I marked with a red box, there's a threaded stud coming out of the fuel rail. I need to remove that stud from the fuel rail since my B&G fuel pressure gauge is supposed to go in there. can ya get another bolt? that threaded bolt doesn't come out its were you put the banjo in line from gas filter ,your missing the cap nut with the pressure washers.